Can three community discussions on religion improve life in Cedar Rapids? Organizers hope so. “Hans Kung has a great quote about there being no peace without the great religions coming together. So, we need to start at that level,” Charles Crawley, president of the Inter-Religious Council of Linn County, said. The council worked with the Cedar Rapids Public Library for a series of three “Know Your Neighbor” events. Crawley says the idea was to work with the library on its mission to improve literacy by offering information that specifically addresses religious literacy and fosters community understanding. 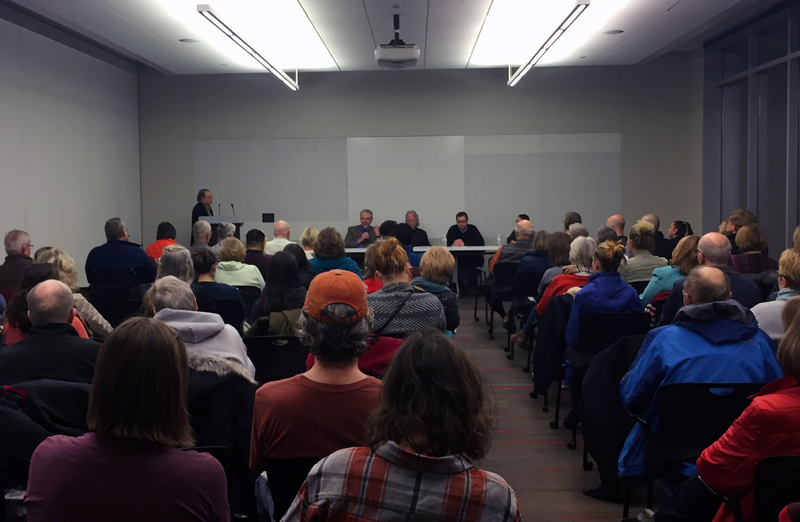 The first Know Your Neighbor religious discussion took place Monday, Jan. 8, 2018, before an overflow crowd at the Cedar Rapids Public Library. It was organized by the Inter-Religious Council of Linn County. The first moderated discussion, featuring the Baha’i faith, Buddhism and Christianity, took place Monday night before an overflow crowd at Beems Auditorium. The number of attendees was a welcome surprise for organizers, who weren’t sure what to expect. Equally surprising, but perhaps less welcome, were two protests. One came days earlier when Crawley hung an event poster at his workplace. “Someone placed a leaflet directly atop the announcement,” he said. Information in the leaflet was attributed to Billy Graham and specific to the Christian religion. Crawley removed the leaflet, something he says he now regrets. “I should have just placed it to the side of the poster,” he said. But the story of that leaflet, as well as three unexpected greeters in front of the library with a sign and leaflets also specific to the Christian faith, made clear to attendees why such discussions are important — in a way the event alone could not have accomplished. “I just took it as people who wanted to make sure their view was heard,” Crawley said. When I pressed further, asking why Christians would want to make such a point during an event highlighting Christianity, he added that those protesting probably do not identify with Steve Knudson, an IRCLC board member, senior pastor at First Lutheran Church in Cedar Rapids and the panelist who represented the Christian faith. It was an opinion Knudson apparently shared, given that he frequently reminded attendees that his assertions and experiences stemmed from a Lutheran perspective and were not representative of the Christian faith as a whole. Similar reminders were offered by all panelists as they described their specific religious traditions and beliefs. In short, the discussion was not what such naysayers seemed to expect and fear. It was not a religious marketplace that encouraged people to select what they found most appealing. Panelists and audience members provided information without ire — something severely lacking in our 24-hour news cycle world. Panelists representing Hinduism, Humanism and Islam will lead discussion Feb. 12. Judaism, Unitarian Universalism and Native American faiths will be the focus March 12. Two more “Know Your Neighbor” events are planned by the Inter-Religious Council of Linn County and the Cedar Rapids Public Library. On Feb. 12 discussion will focus on Hinduism, Humanism and Islam. Judaism, Unitarian Universalism and Native American traditions will be discussed on March 12. All events are at the downtown public library. This column by Lynda Waddington originally published in The Gazette on Jan. 10, 2018.